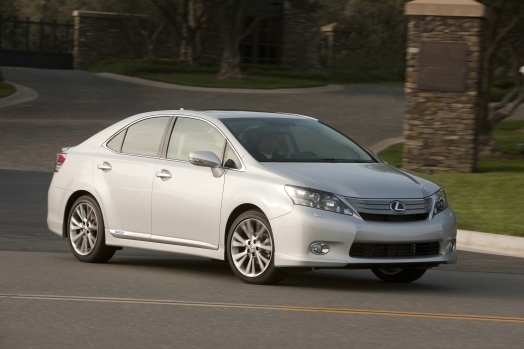 Lexus currently offers three hybrid models: the LS 600h, GS 450h and RX 450h. For most manufacturers that would be more than enough, but for Lexus, it’s a problem. Why? Because the LS, GS and RX aren’t dedicated hybrid platforms, they’re vehicles designed around gasoline power that happen to offer a hybrid drivetrain alternative. At Lexus, that’s just not good enough, so the Toyota-owned company set about building their first dedicated hybrid model, the HS 250h. Loosely based around the European-only Toyota Avensis (not to be confused with the bulbous Venza crossover we get here in the States), the HS 250h is meant to slot into the Lexus lineup as the world’s first entry-level luxury hybrid. Don’t think of this as a tarted up Prius, though. This is a hipper car with a Lexus badge, a more powerful drivetrain borrowed from the Camry Hybrid and enough cameras and technology crammed on board to rival a last-generation spy satellite. It doesn’t look as silly or compact as a Prius either and, in fact, is longer than Lexus’ own IS, the Mercedes-Benz C-Class and the BMW 3-Series. That makes for an interior that’s properly spacious as well as space-aged, all while achieving an average 35 mpg combined. High-class Prius fans, your chariot has arrived. There is a lot of technology in this car, including Lexus’ mouse-like force-feedback Remote Touch controller, a massive navigation screen, a heads-up display and lane-keep assist. A cushy interior with plush, comfortable seats and ample rear leg and headroom thanks to a high roofline and contoured front seats means passengers won’t feel cramped. EV and ECO modes for the hybrid drive system will please hybrid car junkies. While certainly an improvement over existing products, fuel economy of 35 mpg isn’t as high as we’d hoped for, and, in fact, almost matches the BMW 335d on the highway. There may be too much technology crammed into this car to allow Lexus to hit a low price point, which will be key in selling it over lower-priced competitors. Anyone who has ever been in a hybrid will feel at home with the HS 250h’s quiet ride. What they might not feel at home with, however, are the driving dynamics. This is not your typical floppy, wet-noodle-for-a-chassis green car. It’s has a taught, controlled feel that’s never jarring but at the same time never floaty and disconnected – truly indicative of its European roots. It cruises quietly at high speeds and often gives you the sensation that you’re traveling slower than you actually are. The brakes aren’t too grabby the way some regenerative systems tend to be. Yet, while it won’t bore you to death it’s not really exhilarating to drive. Total system output of 187 horsepower proves enough to motivate the car’s rather chunky 3,680-lb mass down the road, and hybrid nerds will love the inclusion of the Prius’ EV mode, which allows the car to run exclusively on battery power up to 25 mph or until (rather obviously) battery power has been exhausted. The HS also features the Prius’ throttle-smoothing, gas-saving ECO mode, as well as a somewhat oxymoronic Power mode. 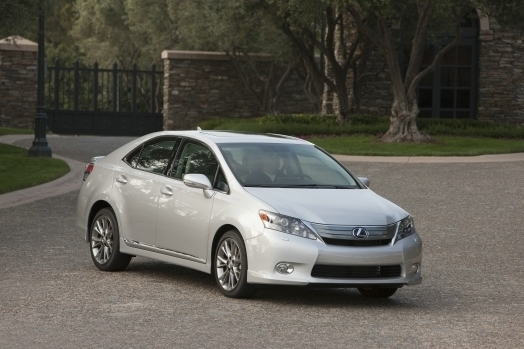 Unlike the Prius’ relatively diminutive 1.8-liter gasoline engine, the HS 250h uses the same 2.4-liter inline four-cylinder as the Toyota Camry Hybrid. The gasoline engine puts out 147 horsepower and 138 lb-ft of torque, which is supplemented by the 40 hp electric motor, resulting in a total system output of 187 hp. Power is driven to the front wheels via a continuously variable transmission. Lexus will be launching a new customer service system this summer, dubbed Enform. Similar to OnStar, Enform provides services such as automatic collision notification, stolen vehicle location (though no shutoff feature is available), SOS, roadside assist and destination assistance. Prius fans will recognize the carryover of EV, ECO and Power modes into the HS 250h. A new Lane-Keep Assist feature takes lane departure warning technology a step further and actively steers the car back into the lane so long as the driver maintains active steering. It uses cameras mounted on the steering column to detect whether a driver is tired or distracted. You read that right, the car is watching you. Where to start? The HS 250h is packed with innovations, from its IR-resistant windshield to Lexus’ new Remote Touch system. A heads-up display keeps driver attention focused on the road while delivering select information onto a windshield display. Opt for the nav system and you get a massive folding screen mounted above the center stack. The system is controlled by Remote Touch, a fancy mouse-like controller located on the center console that provides force feedback as you browse though onscreen menus. Spend two minutes with it and you’ll wonder why it took so long to figure out something this good. Given that the HS 250h borrows its hybrid system from the 33/34 mpg Camry Hybrid and puts it into a more slippery, aerodynamic body, we expected some improvement in the fuel economy department. 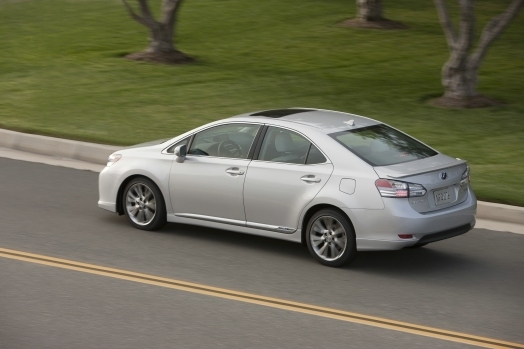 At 35 mpg city, 34 mpg highway, the Lexus offers slight efficiency improvements over the Camry, but not as much as we had hoped for. It does, however, achieve an SULEV emissions rating. Due to the high mounting of the Remote Touch controller, the center console pushes farther up into the cabin than we’re typically used to, creating a miniature wall between driver and passenger. Rear seat passengers need not worry about leg and headroom, as the backs of the front seats are contoured and the roofline remains high in the rear. All materials are plush and high quality – everything we’ve come to expect from a Lexus. That is, save an assortment of iffy Toyota switches that can be found throughout the cabin. While the HS 250h isn’t quite as quirky looking as a Prius, its aerodynamic shape is still clearly that of a dedicated hybrid. A front-end with minimal ducting for cooling leads into a long, angular windshield before the beltline finally tapers into a high rear deck. The windshield absorbs around 30 percent more infrared radiation than traditional units, reducing AC load. Overall it’s an attractive shape, even if it does look like Prius and an Acura TSX crossed DNA strands. Pricing for the HS 250h will not be announced until roughly early August, so right now it is anyone’s best guess. Due to its technology-laden spec sheet however, we expect it to slot in somewhere above the IS sedan, perhaps around $35k. Its has no true competitors, but optioned-out versions of the Toyota Prius ($22,000), Toyota Camry Hybrid ($26,150) and Nissan Altima Hybrid ($26,650) could fit the bill, as could the BMW 335d ($43,900). Given the ongoing halo effect of hybrids in the US, the HS 250h could be a big hit for Lexus as it gives the more discerning, tech-obsessed, alternative energy buyer everything they want. On top of this, it’s plenty comfortable, stylish and a surprisingly competent steer. If Lexus can manage to price this piece of heavy circuitry in the low $30k range, they should have little problem hitting their 25k sales target for the first year.